This is one of my very tippy top beauty must-have’s. If I could only have a few skin care products in my drawer, this would hands down make the cut. Even better? It’s only $1.87. 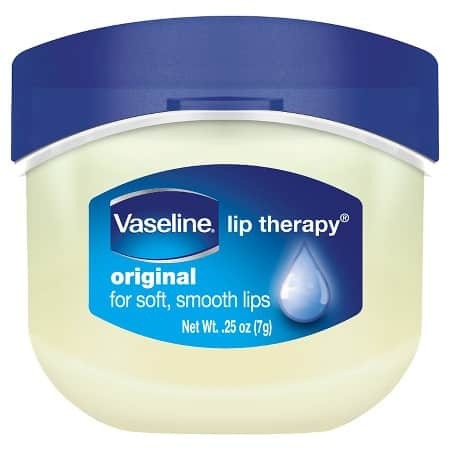 I’ve tried lip balm after lip balm, and while there are lots that I really like, nothing has ever come close to topping regular Vaseline Lip Therapy. I always come back to this. Nothing else soothes my lips more quickly, or truly prevents them from flaking and peeling. Price – Did I mention it’s only $1.87? Convenient – Many people keep that typical large jar of Vaseline in their medicine cabinet for treating burns, cuts and scrapes. Not many people use it regularly as a lip conditioner or are even aware that the brand sells a variation of its core product in a tiny little 0.25 oz. jar, specifically for use as lip balm. The tiny jar makes it perfect for stashing away in a pocket, a drawer, a handbag or a car. Effective – I apply a tiny bit and within minutes, my lips are smooth as glass. One trick I love is to apply my lip liner first (applying vaseline before liner makes it hard for the liner to go on). Next, apply a bit of vaseline and wait a couple of minutes. Lastly, I apply my favorite lip gloss on top. Creme Brulee – Same as the regular formula, but with a more delish scent. Love, love, love. Cocoa Butter – Similar formula, but infused with cocoa butter. It also has a warm, cocoa butter scent. I like this one just as much as the original and Creme Brulee formulas, but didn’t notice a difference in how well it worked. Pink – Similar formula, but tinted. So great. Of all the formulas, this one is slightly different. Therefore, a full review is coming soon! Love this helpful review and tips. Is this formulated differently than the Vaseline in the big tub or just packaged differently? Hey, Don’t forget to add….. This product is highly recomended by Pageant titleholders as well.